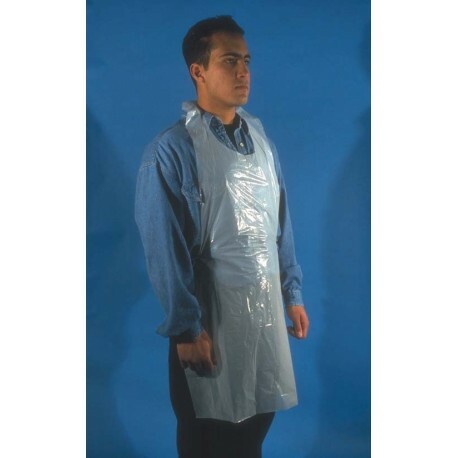 Protect Your Clothes and Skin From Contact With Industrial Chemicals With This Disposable Apron. You never know when you will need quick, one time protection from UV materials. Perhaps it is to handle a sudden spill, to show a new client around your plant, because your regular protection is already in use, or some other unforeseen circumstance. To be ready for times like those, SAF-T-CURETM offers a full line of economical disposable safety products. Make sure you are prepared - always keep a set nearby. SAF-T-CURETM DISPOSABLE APRONS are UV-tested, durable and have a full cut and high bib to provide neck to knee protection. The aprons tie at the waist and feature a halter neck. Economical protection for light to medium duty use. Combines flexibility with resistance to chemicals, fats and oils.